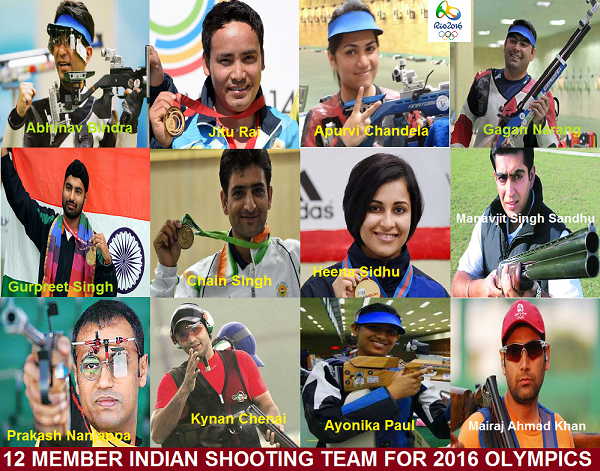 12-member team represented India in the 2016 Olympics shooting in 11 events from Aug 6-14. Despite the presence of medal winners and many world class shooters, the team could just get into two finals, and 4th by Bindra was the closest India could get to the top three in any event. Team included three women shooters with 4th time Olympian Beijing 2008 air rifle Gold Medallist Abhinav Bindra, London 2012 bronze medalist Gagan Narang, and multiple-time Worlds medalist Jitu Rai. India has won four medals at Olympics so far. As the team provides the biggest opportunity to win medals for India, the only individual Olympic Gold medal winner of India, Abhinav Bindra was the flag bearer of India for Rio Olympics. Gagan Narang will participate in maximum 3 events, while Jitu Rai, Chain Singh, Gurpreet Singh and Heena Sidhu will participate in 2 events each. In 10 m air rifle, 50 m pistol, 10 m air pistol, Women’s 10 m air rifle and 50 m rifle 3 positions, India will have 2 participants each. 8 Aug Abhinav Bindra 10 m air rifle – Finishes 4th in Final. Loses by 7 seconds. In 2012 Olympics, 11 team members of 7 men and 4 women earned two medals. Vijay Kumar won Silver in 25 m rapid fire pistol while Gagan Narang won Bronze in 10 m air rifle. Joydeep Karmakar finished 4th in 50 m rifle prone. Abhinav Bindra, Sanjeev Rajput, Manavjit Singh Sandhu, Ronjan Sodhi from Men’s and all four women shooters Shagun Chowdhary, Rahi Sarnobat, Heena Sidhu and Annuraj Singh failed to qualify for the finals. While Rajyavardhan Singh Rathore was the first medal winner for India in shooting when he won Silver in 2004 Olympics in Men’s Double Trap, Abhinav Bindra is the only Indian athlete to have won individual Gold medal at Olympics. He achieved the historic feat in Men’s 10m Air Rifle at 2008 Olympics. Jitu Rai is the first Indian shooter to win five international medals in a calendar year.